The expected landing track of the space shuttle Discovery as it descends from northwest to southeast over the heartland of America. As of Nov. 6, 2007, NASA expects the seven-person crew to touch down at Kennedy Space Center at 1:01 p.m. EST (1801 GMT). For the first time since the tragic loss of Columbia in February 2003, early this afternoon, a space shuttle will attempt a return to Florida's Kennedy Space Center by taking a path across the contiguous United States. The orbiter might be visible to keen eyes along the flight path. And many people are likely to hear its sonic boom. The Shuttle Discovery—which undocked from the International Space Station early Monday—is aiming for a touchdown at NASA's prime landing site in Florida. There will be two possibilities for a Florida landing, on orbits 238 and, if necessary, orbit 239. If all goes according to plan, Discovery will fire its twin braking rockets over Mongolia at 11:59:12 a.m. EST for 1 minute and 58 seconds, slowing the shuttle down for its de-orbiting and a gradual slide back to Earth, which will last for just over an hour. 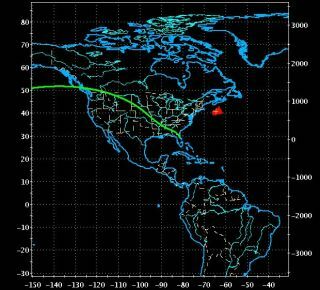 On orbit 238, Discovery will cross the western coast of North America at 12:39 p.m. EST (9:39 a.m. PST), just north of Vancouver, British Columbia. Traveling on a southeast trajectory, the orbiter will be passing over northwestern Montana just a minute later (10:40 a.m. MST). Four minutes later (11:44 a.m. CST), Discovery will be streaking over southern Nebraska. After another two minutes have elapsed, it will be racing over Springfield, Missouri, and by 11:49 a.m. CST it will be over central Alabama. At 12:55:16 p.m. EST, the shuttle will decelerate to two and a half times the speed of sound (mach 2.5), dropping to an altitude of 80,000-feet just to the northwest of Cape Canaveral. Touchdown is scheduled for 1:01:50 p.m. EST. Should Discovery be waved off on this first attempt, a second attempt will be made on orbit 239. On this track, the shuttle would reach the Oregon coast just northwest of Portland at 11:13 a.m. PST, passing over Salt Lake City at 12:16 p.m. MST, Dallas-Fort Worth at 1:20 p.m. CST, and Baton Rouge by 1:22 p.m. CST. After a six minute trek across the Gulf of Mexico, Discovery would reach the west coast of Florida north of Tampa at 2:28 p.m. EST, with a landing at KSC at 2:36:12 p.m. EST. The landing tracks can be seen at this NASA site. If you live very near or directly under the re-entry track, you might want to try and view Discovery as it comes down through the atmosphere on its northwest-to-southeast path. A reentering shuttle usually appears as a very bright "star" leaving a long contrail in its wake. In a dark or twilight sky, the view of this reentry fireball can be a spectacular sight. Today's reentry, however, comes during the daytime. Is it still possible that the shuttle will be seen? "Yes," says veteran satellite observer, Dan Laszlo. This Fort Collins, Colorado amateur says: "I have also seen Shuttles on entry in daylight, appearing about as bright as Venus at around magnitude minus 4, so it's possible, though not the spectacle of a night entry." Another assiduous skywatcher, Dr. Dale Ireland of Seattle, Washington agrees with Laszlo. "It would be hard to spot in daylight, but not impossible." Certainly, the clearer your sky with few or no clouds and little or no haze will improve your chances of making a sighting. If you can't see the shuttle, perhaps you'll hear it. As it races earthward, it produces a double sonic boom. Sonic booms are created by air pressure. Much like a boat pushes up a bow wave as it travels through the water, a vehicle pushes air molecules aside in such a way they are compressed to the point where shock waves are formed. The reason for two booms is that the shock waves form two cones, at the nose as well as at the tail of the vehicle. The shock waves move outward and rearward in all directions and usually extend to the ground. Those who live near and around the Kennedy Space Center are accustomed to hearing the double booms of a returning shuttle, but those located under and close to the Shuttle path, perhaps all the way back to the Pacific coast, may also hear the booms as well. From a location in the nation's midsection or over the northwest United States, where the altitude of the shuttle will be in the range of 100,000 to 200,000-feet, it will take time for the shock wave to propagate down to the ground. Sound travels at roughly 1,100-feet per second, so depending on where you live relative to the track, it could be anywhere from 90 to 180 seconds after the shuttle has passed on by before you hear anything. "You will definitely be able to hear the sonic boom a few minutes after it passes directly overhead if that is where you will be watching from," writes Texas amateur, Jeff Umbarger. "And I once heard three booms in short succession. I can explain two of them (the over and then under pressure wave) but not three (probably a bounce off some thermal layer way up)." Another Texas observer, John A. Dormer, notes: "In 1999, one of the shuttles came in just after sunset, on a ground track between Waco and Austin IIRC. I figured it'd be about 12 minutes before the boom hit Kyle, TX, which is south of Austin by 20 or so miles. I heard a "Whump-wuh-whump" within about thirty seconds of when I thought it would happen. There were uncertainties in my understanding of the atmosphere, but I knew my prediction would be early." Images: Yes, Sonic Booms Can be Seen!